Want to start an argument in 1910? Surefire ways to pick a fight included expressing strong views in favor of socialism, women’s suffrage or school vaccinations. The papers were irresponsible in printing stories concerning the most popular conspiracy theory – that the smallpox vaccine could (somehow) cause fatal lockjaw. A vaccinated child who steps on a rusty nail can contract tetanus just as anyone else, but rarely did the papers suggest the cause of dying could be something other than contaminated vaccine. A hallmark of these articles is also to claim doctors were “puzzled” by the death or were insisting they could not be blamed for it, making them sound villainous. 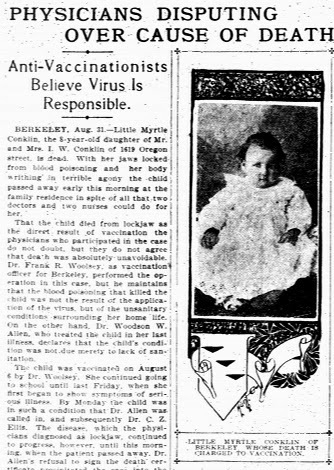 In a particularly egregious bit of yellow journalism, the San Francisco Call reported the 1904 lockjaw death of little Myrtle Conklin with a lengthy quote from the doctor who gave her the shot, including “My duty ends after I have applied the virus…I fail to see just how I was responsible for this death.” The article was accompanied with a picture of beautiful baby Myrtle – who was actually eight years old when she died. Some Santa Rosa parents were among those protesting the compulsory vaccinations, as described in the earlier item from 1907. But it was Berkeley that was at the vanguard of the “anti-vaccinationist” movement in the Bay Area, with some type of showdown nearly every year in that decade. One year 249 children were ousted from school for failing to have proof of vaccination when classes began in September, and their parents vowed to raise money for an injunction to force the school board to admit them. Another year they obtained a six month waiver from the district because they insisted the state would repeal the vaccination law by then. Another time the Berkeley parents swore they were gonna start their own private school for all their little special snowflakes to attend, as the law only mentioned vaccinations for public school students. Whether it was an unintentional loophole or a carve-out in the law, the “private school” exemption made big news in 1910, when a Superior Court judge in Santa Cruz ruled it made the vaccination law unconstitutional because it was discriminatory – and besides, there was no need for enforcement as there was no epidemic at the time, revealing his bias for the anti-vaccinationists. The judge’s decision caused excitement statewide; the Press Democrat printed the story below at the top of the front page, directly below the paper’s nameplate. Other papers added local color by interviewing their Superintendent of Schools, which as a group disliked the law because it forced them into the awkward role of being the vaccination police. “Parents have said to me frequently that they would take their children out of the public schools and send them to private schools rather than have them vaccinated,” the San Francisco Superintendent told the papers. Santa Cruz, March 22 — Judge L. S. Smith rendered a decision against the State Board of Health here today in an action brought to compel the pupils of the Watsonville schools to be vaccinated. The Watsonville trustees had refused to enforce the law on vaccination and a petition for a writ of mandate to compel them to bar from the schools all children who had not been vaccinated was applied for by the State Board of Health. The action affected about 250 children.